Hearts of Fire by The Voice of the Martyrs, a non-profit interdenominational organization, opens up readers’ souls in new and profound ways. 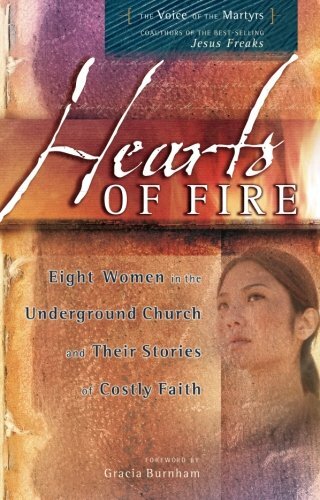 The stories of eight incredible women and their desire to spread the gospel against extreme adversity will overwhelm the heart with passion, love, and forgiveness. Each experience personifies Philippians 4:13, “I can do all things through Christ that strengthens me.” The unmovable faith of each one these female heroes became their north star, guiding them through challenge and danger in pursuit of God. We, the readers, are invited to journey along with them in Hearts of Fire. “Adel then heard the screams of her mother, her mother-in-law, and her precious Anto, and she knew they were being massacred by the vicious thugs who had driven them from their home. It was too much to bear” (17). This is the story of Adel and her initiation into a life of extreme torture by Jihad soldiers. Adel faced the heartbreaking loss of family members and her freedom. Throughout her captivity, she was beaten and tortured over and over, because she would not denounce her God. She repeatedly refuses, screaming, “The blood of Jesus is all powerful” (18). Her insurmountable strength, like a flood, spills over every page of her story. Chapters two and six share the testimonies of Purnima and Ling. The stories of these brave women are shaped by their youth and passion. Purnima, born in a Buddhist country, stood firm against her family and society to follow Christ. She was imprisoned for fourteen months at the age of fifteen. Although she was in confinement, her soul remained free and she was able to demonstrate the love of Christ through acts of kindness to other prisoners. Ling was as young as Purnima when she began sharing her faith from village to village in her native country of China. Many in the Christian circle tried to dissuade her from her ministry, because she was a woman doing what was considered a man’s job. Despite criticism, she continued to preach with tenacity, never letting anyone derail her from living out her spirit-given calling. A curious heart, captivated by God’s love and grace marks the testimony of Tara in chapter 5. A Muslim girl from a prominent family who converted to Christianity, Tara faced extreme adversity in her own family. She was forced to go on the run when her father and brother discovered she had attended secret meetings at a local Christian church. The two men beat her brutally before she escaped with a few belongings and little to no resources. Tara would have faced death by hanging had she ever been captured, but she refused to yield. In chapter four, readers hear the heart wrenching story of Sabina. Sabina and Richard, a couple dedicated to doing God’s work, experienced great hardships in the name of faith. Sabina was imprisoned in a slave labor camp for three years. Her husband Richard spent a total of fourteen years in prison. Throughout his sentence, Richard was beaten and tortured savagely. It was all because of their relentless love for God and determination to become God’s extended hands on earth despite personal risk. The newsletter, The Voice of the Martyrs was birthed out of these harrowing experiences. It has become the voice and stories of those in the trenches for Christ. These are just some of the stories of great servant leaders. Chapters three, seven, and eight trace the testimonies of Aida, Gladys, and Mai, three more women heroes whose sacrifices light the way for Christians all around the world. I highly recommend this book to those that are entering the missionary field, men and women alike. It is also a perfect source of inspiration and encouragement for those weighed down by the challenges life brings. Hearts of Fire will lead the reader into a space of gratitude that will cause a shift in the core of their humanity. These stories will renew in readers a reverent love for Christ and truly set their hearts on fire.